Last week, Jasmine (one of our two Hubbard Fellows) and I spent a morning at the Derr Wetland Restoration here in the Platte River Prairies. We wanted to get some photos and video of the site before the latest snow melted. …Ok, to be honest, we were mostly hoping to test out the capabilities of our new drone (UAV). Two of our Nebraska board members, Jim and Nancy Armitage, donated the funds to purchase the drone as a way to help us better capture our sites and the work we’re doing here in the state. We’re just starting to figure out the potential for drone photography, but I sure like what I see so far! Here is a short 3 minute video of footage shot from the drone, followed by some still photos from the same morning. Both the aerial video and still photos provide powerful images, but the video certainly captures the context of the site in a way that’s not possible for me as I walk along the ground with my camera. I think the drone is going to be an awesome complement to the other ways we photograph and monitor our sites – it’s going to be exciting to keep exploring the possibilities. Stay tuned for future videos! 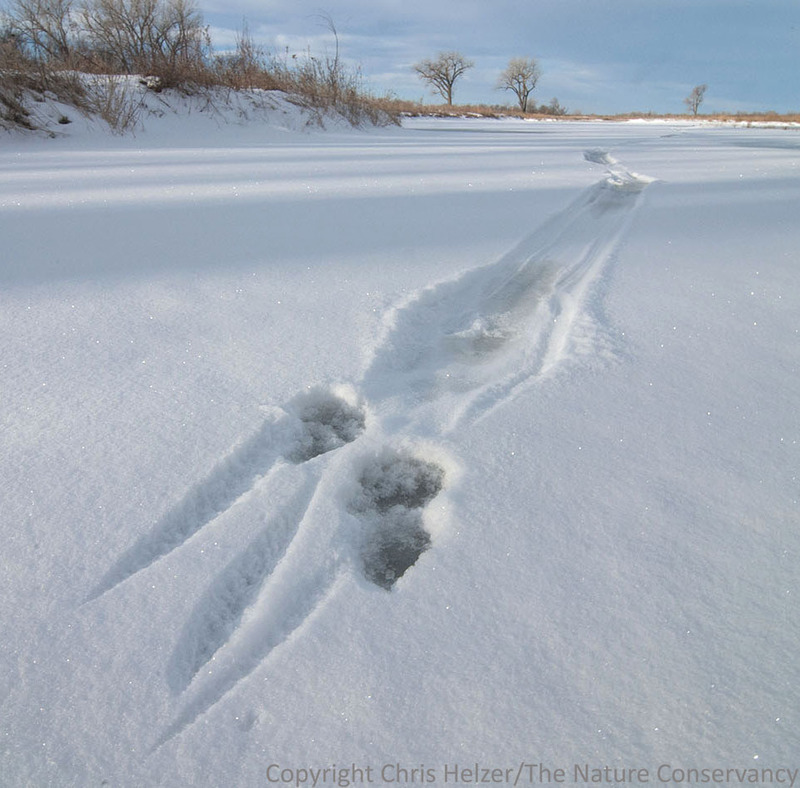 Tracks of a river otter sliding across the ice/snow. No, I didn’t see the otter. Thanks for asking. 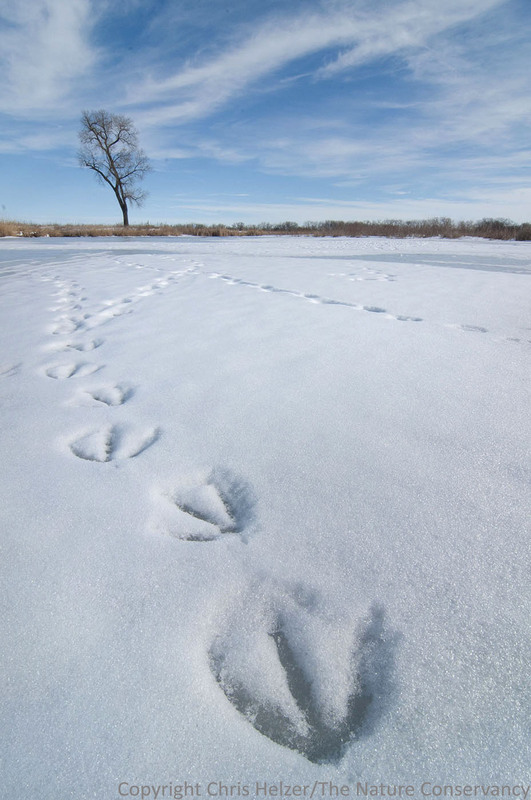 Canada goose tracks were all over the site, along with coyote, mink, rabbit, and many others. 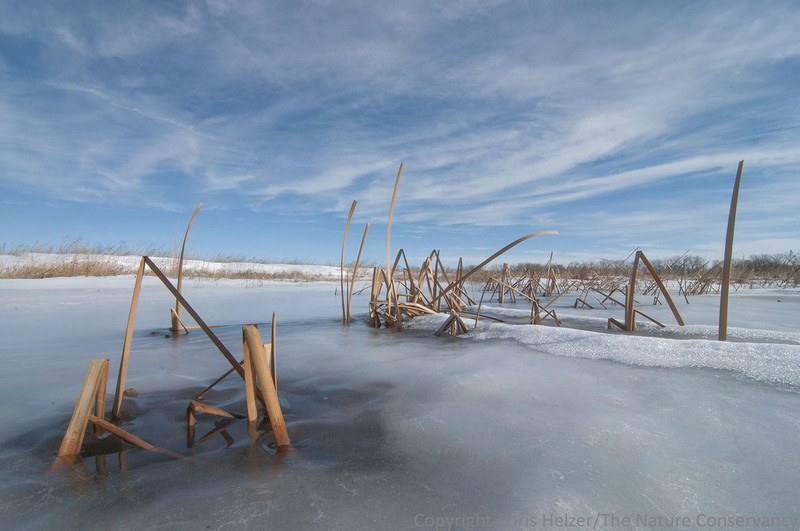 Photographing from the surface of the ice provides a neat perspective of the wetland, but a very different one from the drone’s aerial view. 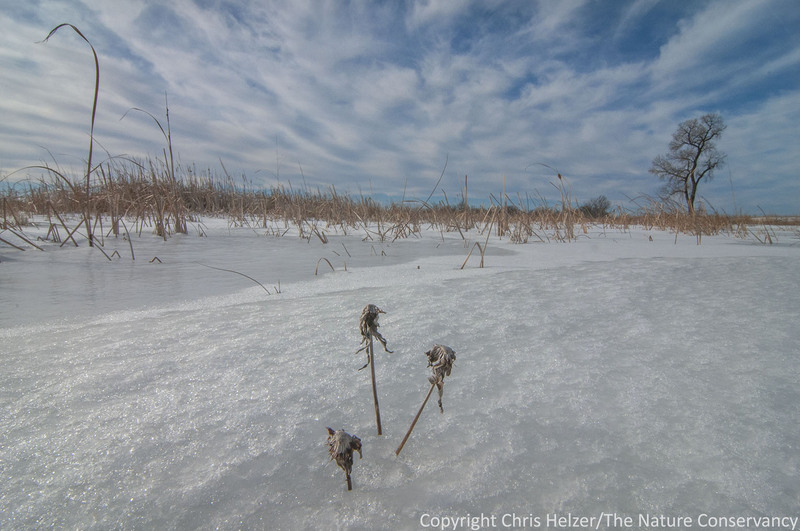 This entry was posted in Prairie Animals, Prairie Natural History, Prairie Photography, Prairie Restoration/Reconstruction and tagged 3drobotics, derr wetland, drone, iris+, otter, photography, platte river prairies, the nature conservancy, tracks, uav, wetland, wetland restoration, wildlife by Chris Helzer. Bookmark the permalink. wow, very cool! I can only imagine how much info can be gathered in a short time frame – and sometimes in conditions that it would be very challenging for humans to be onsite. Wonder whether the wildlife will pay much attention? Or might a territorial bird take offence….can envision some hilarious footage involving a crazed red-winged blackbird…. That’s excellent. It will be a valuable tool for you. Be sure to have the drone available to get a great perspective during prescribed burns! Piloting a drone sounds like much more fun than driving a tractor. That will give your fellows something extra to add to their resumes. They should bring videos they have captured to show off at future interviews. Love these! Thank you very much! Nice photos and comments. You have a fine blog, Chris. These deep perspective stills are incredible. The drone introduces a whole new range of possibilities for viewing the prairie! I want one! Very much what I was thinking, Marilyn – Lovely resolution and depth! Curious on the type of drone and/or camera that you are utilizing? Great video and cool way to get that perspective for sure! Adam, we’re using an Iris+ by 3DRobotics. I love Nebraska’s beauty – I hope you never stop taking still photos – because that’s the sense you get from your photos, stillness. Could a drone fly upside down and get pictures of the stars? I’d love to see the prairie sky!